Craft Measure displays a reference image on your phone. You compare what you are measuring with the reference image. The accuracy you'll experience will vary with your visual skill and will improve some with practice. Based on testing with a small number of people, we believe that most people will be able to reliably distinguish items 2 sizes apart and will more often than not get the exact size. Caution! Be careful not to scratch your phone's display with the end of a knitting needle or crochet hook! Craft Measure for Windows Phone 7 is not free. It has a trial mode, however, that enables you to try out all of the functionality. The chief limitation of trial mode is that you must carry out the calibration step every time you start the application. 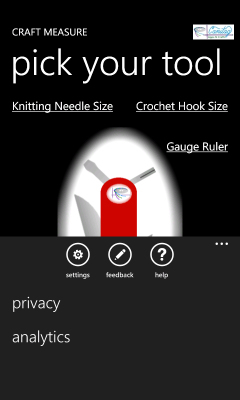 Craft Measure Windows Phone Edition is a standard Metro style application. The top of the screen has a banner identifying the product (Craft Measure), our company (Canitag Apps N Crafts), and the page name. The main page is the launching point for all of the measuring tools offered by Craft Measure. Initially, as the previous image shows, only the link launching the Calibration tool is shown in the bold text that indicates the tool is usable. After you do the initial calibration, all of the links to the tools will be accessible. To launch a tool, just tap its link. The main page has one difference from the other pages. The main page has an application bar. On the main page, if you are holding the phone narrow end up, the bottom of the screen has an application bar with four icons and an ellipsis (...). The application bar will be found to one side or the other if you are on the main page holding the phone long end up. The settings page has two sections. The first section lets you indicate your preference how things are sized. You can choose between the conventions used in the US (as recommended by the Craft Yarn Council of America -- a modern standard), the system used in Canada, the system used in the rest of the UK, the system used in Japan, and generic metric system sizing (common in Europe). A crash dump report identifies the type of phone, version of software, and location of a crash. The information we collect does not identify you, your phone, or contain other personal information. We use the information to help us fix the problem. An analytics report identifies the type of phone and version of sofware. It conveys some performance data and some feature usage data. The report does not contain personal information, although it does hint at personal behaviors. We aggregate the performance and usage data to take away the temptation to track usage patterns of individuals. You can see the kind of data contained in an Analytics report by scrolling up in the application bar and selecting the analytics menu item. If you have not yet purchased a full license to Craft Measure, you will be offered the chance to do so at this point. In trial mode, you will have to (re-)calibrate Craft Measure every time you start the application afresh. If you leave Craft Measure to run another application then return via the back button, trial mode will not forget your calibration. The goal is to make the white bar as close as you can to the size specified in the text. The little white triangular projections are intended to help point out how big the target size is. Put your finger on the screen on or near the big white bar, then move you finger along the length of the bar. The length of the bar will change to track your finger. 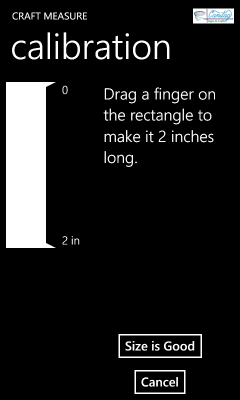 You'll need to hold a ruler against the face of your phone to measure the length of the bar. When you've got the size right, tap the button Size is Good. Because digital displays sometimes have pixels that differ in length and width, you'll need to do this calibration process once for the long dimension of the phone and once for the short dimension. You can hold the phone either horizontally or vertically while calibrating it. Whichever way you hold the phone, adjust the bar until it is the specified size. 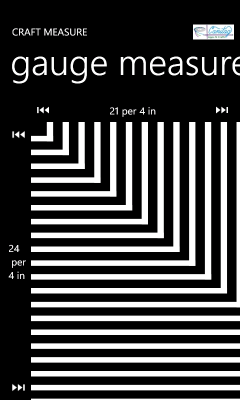 The Standard Ruler link on the main page leads to a page that shows a ruler running the long direction of your phone's screen. 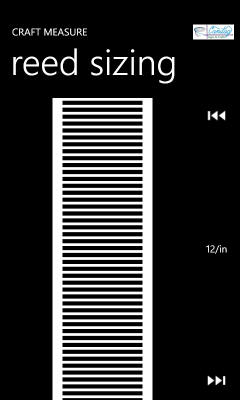 The image that follows shows what the ruler will look like if you are holding your phone upright and have configured Craft Measure to use inches. The image above was captured with a poorly calibrated phone. 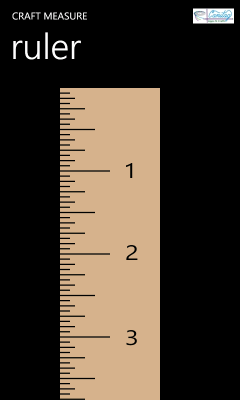 A typical Windows Phone will have a ruler that is a little over two inches long if held upright or two and three quarters inches if held sideways. Hint: hold your phone landscape style, as if taking a panoramic photograph. If you have configured Craft Measure to use one of the metric sizing systems, the ruler will be labeled in centimeters and have a small tick for each millimeter. 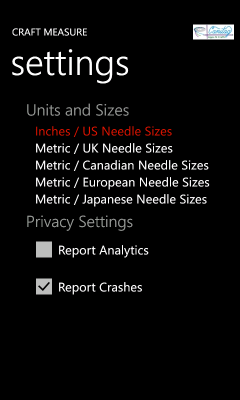 Craft Measure has built in knowledge of how big knitting needles are in the US, Canada, the UK, Japan, and Europe. 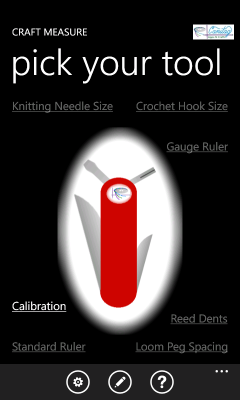 Tap on the Knitting Needle Size link on the main page. Craft Measure will jump to a page that has a horizontal white band in the middle. The white band is as close to the actual diameter of a knitting needle of a particular size. Below the white band, Craft Measure will tell you the size of the knitting needle it drew and two double-triangle icons. Tapping the rightmost icon tells Craft Measure to show the next bigger size. Tapping the leftmost icon tells Craft Measure to show the next smaller size. Place the knitting needle you want to size on top of the white band. If the needle completely obscures the white band, ask Craft Measure to show the next smaller size. 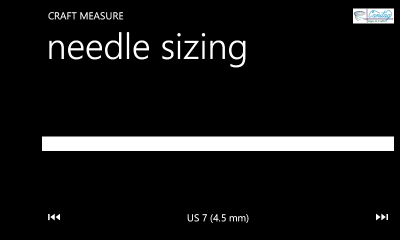 If you see white above and below the knitting needle, tell Craft Measure to show the next larger size. The goal is to find the size needle that just barely blocks the image. Our limited user testing indicates that you should look for either the largest needle size that completely obscures or, if there is a size that has a bit of halo without clearly showing a band of white, go with the halo. Hints: If you hold your phone very close to your face or don't hold the needle against the phone display, you'll get less accurate results. Try holding the phone about a foot away from your face. The size won't always be perfect, particularly when you get into the smaller sizes of knitting needles. The image is made up of tiny dots of light that can't be split in half. In addition, manufacturers vary a bit in how big they make needles. In the US, there has been disagreement and changing definitions about what size number to assign to a particular diameter. Craft Measure uses the Craft Yarn Council of America's current size number / needle diameter definitions for US sizes, plus a couple of oddball sizes that seem to still be fairly common. Empirically, we observed that the person with the most practice using Craft Measure could reliably size needles when the nearest alternative sizes were 0.5 mm or more different. Sizing needles in this fashion is nowhere as fast as sizing them with the special-purpose needle sizing plastic or metal tool with holes (at least, the holes are faster if you can find your tool). Craft Measure has built in knowledge of how big crochet hooks are in the US, the UK (including Canada), and the rest of the metric world such as Europe. 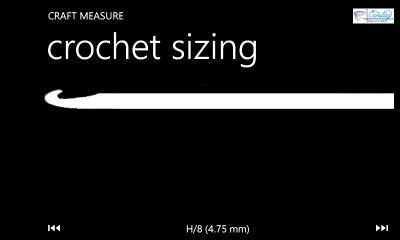 Tap on the Crochet Hook Size link on the main page. Craft Measure will draw on its screen a horizontal crochet hook hook portion plus white band for the shaft. The diameter of the shaft will be as close as possible to the actual diameter of the shaft of a crochet hook of a particular size. Below the white band, Craft Measure will tell you the size of the crochet hook it drew and two double-triangle icons. Tapping the rightmost icon tells Craft Measure to show the next bigger size. Tapping the leftmost icon tells Craft Measure to show the next smaller size. Place the crochet hook you want to size on top of the white band. Specifically, place the portion of the hook between the end of the shaping of the hook proper and the start of shaping for the handle against the straight portion of the band. You want to compare the nice, cylinder shaped portion of the hook against the nice straight portion of the image. If the shaft of the hook completely obscures the white band, ask Craft Measure to show the next smaller size. If you see white above and below the shaft, tell Craft Measure to show the next larger size. The goal is to find the size needle that just barely blocks the image. Our limited user testing indicates that you should look for either the largest hook size that completely obscures or, if there is a size that has a bit of halo without clearly showing a band of white, go with the halo. Hints: If you hold your phone very close to your face or don't hold the hook against the phone display, you'll get less accurate results. Try holding the phone about a foot away from your face. The size won't always be perfect, particularly when you get into the small steel lace crochet hooks. The image is made up of tiny dots of light that can't be split in half. In addition, manufacturers vary a bit in how big they make crochet hooks stamped with the same size number or letter. In the US, there has been a lot of disagreement and changing definitions about what size number or letter to assign to a particular diameter. Craft Measure uses the Craft Yarn Council of America's current size number / hook diameter definitions for US sizes, plus a couple of sizes not included in the Craft Yarn Council of America's standard. We found (with admittedly a small number of testers) that it is difficult to reliably nail down the size of a crochet hook to 0.5 mm or less. Generally, the errors tended to estimate crochet hooks as having smaller diameter than the size specified by the manufacturer would suggest. If you are knit or crochet, you've doubtless had the experience of starting a swatch square and having to decide if the gauge you're getting is close enough to warrant continuing on to make the square large enough to get an accurate gauge. Craft Measure has a tool to help. Tap on the Gauge Ruler link and you'll be sent to this gauge measure page. The gauge measure page shows two series of white lines that merge along a diagonal. Each series of lines is spaced out evenly to provide a visual reference. Each series is labeled by how many lines there would be in a standard gauge square (4 inches or 10 centimeters). The double-triangle icons to the either side of each label can be tapped to increase or decrease the number of lines per gauge square. The procedure here is to lay your still-small gauge square against the phone so that one set of lines run parallel to the rows and the other set of lines run parallel to the columns of stitches. Now you can eyeball to see if the lines parallel to the rows are more or less closely spaced than the rows. Tap the double-triangle outline until the lines and rows are pretty much in sync. Now repeat the process for the columns of stitches. When you are done, you can read off the phone a rough measure of your gauge. If you are shooting for a particular gauge, use the double-arrow icons first to set the phone for your target gauge. Then compare your swatch-in-progress to see if it looks close. Caution! This tool will not give you a gauge accurate enough to know that you can proceed with your project and get a good result. You need to do a full sized gauge square and give the square a chance to rest (or be washed into) a size representative of your finished project. The gauge measure tool is only intended to make it less painful to decide if your needle or hook size is close enough to warrant working up a full gauge square. If you happen to find that one of the reeds for your loom has lost its label identifying how many dents per inch (or per centimeter) it has, you can use Craft Measure to figure out the spacing of dents. Tap on the Reed Dents link on the main page. You'll be sent to a page that shows a miniature reed. The image is labeled by how many dents per inch it is playing. The pair of double-triangle icons to either side of the label can be tapped to select a larger or smaller number of dents per inch (or centimeter). Select your best guess for the dent spacing of your reed then hold your phone on the other side of the reed. Look through the reed. If all of the white lines are nicely centered in the gaps in your reed, you guessed right. If not, tap a double-triangle icon to try a different spacing. Try to stay a full arms length from the phone. If you get too close, you'll be looking at a significantly different angle through each of the gaps in the reed. That will throw off your observations. You want your eyes to be looking as close as possible to perfectly straight through the reed at the phone. Craft Measure's peg spacing tool is much like its reed dent spacing tool. You reach this tool by taping on the Loom Peg Spacing link on the main page. The tool will depict a row of pegs spaced evenly. If you have a knitting loom or weaving peg loom and would like to know how many stitches or threads per inch (or centimeter) a project will have while on the loom, you can use this tool to find out. The line of pegs is accompanied by a label identifying how many pegs per inch (or centimeter) are shown by the image. On either side of the label is a double-triangle icon. 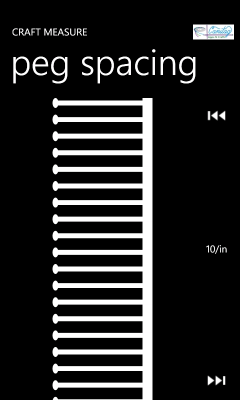 Tapping one icon increases the number of pegs per inch (or centimeter). Tapping the other decreases it. Set the spacing of the pegs to your best initial estimate, then hold your phone behind the pegs of the loom to compare. Tap the double-triangle icons until the image and the pegs line up as exactly as possible. Then read off the number of pegs per inch (or centimeter).